Friday is our 10th anniversary and we are heading to The Melting Pot for dinner. I love going there to eat. It’s pricey, but as a bander the extended meal actually allows me to eat a little bit of all 4 courses. Of course, I don’t even want to contemplate how many calories I ingest there…LOL! At least with it being more expensive, it is only once in blue moon that we go. Well, I finally had to spill about Bryan’s anniversary present. We were supposed to go on a flight around the local area tomorrow (29th) morning but we had to reschedule till Friday morning because of the weather. I was bummed, because I had everything planned for this morning; Bryan’s work, childcare and all but what can you do?! So, now I have to search down childcare for Friday morning. Bryan is already off on Friday, so at least that is one less thing that I need to figure out. Bryan already bought my anniversary present but now wants to get me something else. He knows I have been trying to find an eternity band to go below my wedding set. I want something unique. Emeralds are my favorite stone but they are pretty fragile and I need something that will stand up to everyday wear. 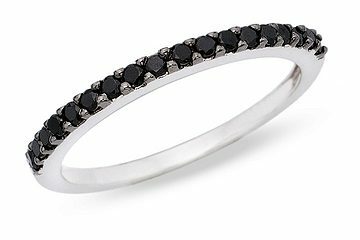 So, he got me this (my wedding band has black accents). It won’t get here by Friday but I’ll share a real pic when it does. Ahh, Twitter. It has become a new addition (follow me if you tweet, I’m thatdegirl). Along with that addiction comes finding a Twitter iPhone app that actually meets all my needs. I use TweetDeck on my computer but I don’t like it on the iPhone. I love how Twitterrific looks on my iPhone but don’t like how it handles my feed. I really like TwitterFon but the free version ads bug me. I have heard raves about Twittelator and BirdFeed but they don’t have free versions to try out. I am leaning towards buying TwitterFon Pro…anyone have any recommendations? I promise you, I do not need the benefits of acai berries, do not need my bits enlarged, do not want a colon cleanse. I promise I already have my high school diploma and do not want free airline tickets to Timbuktu. It would be more worthy of your time to send your promotions to another soul. 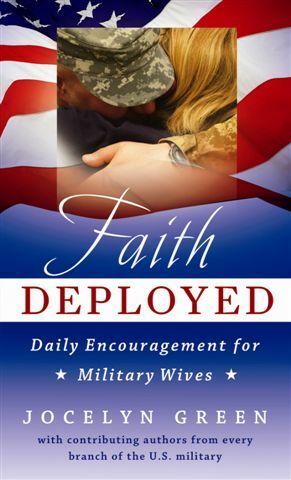 The other day, I got sent a copy of “Faith Deployed” by Jocelyn Green and Sara Horn from Wives of Faith contributed as well. Via emails, the author is just so sweet and caring. I agreed to read the book and then post a review. I haven’t had a chance to start it yet (hope to Saturday) but from what I have seen flipping through, it is going to be awesome. Faith and spouses are 2 aspects not heavily mentioned in military life as I experience it, so it is nice to see this topic addressed.